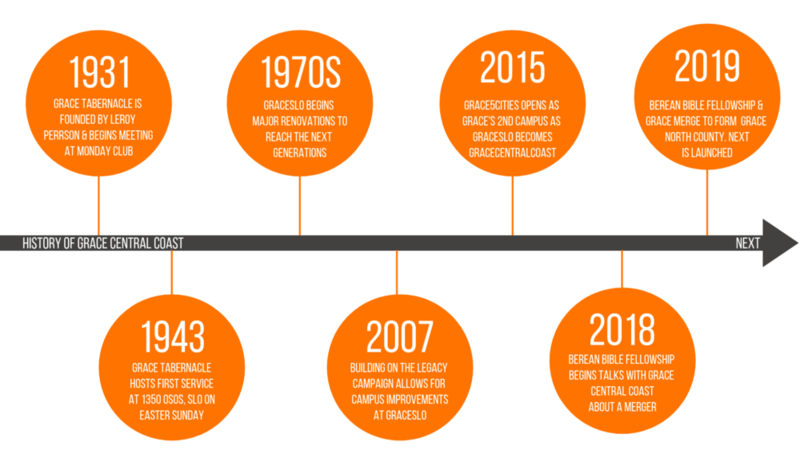 When I look back on the amazing and fruitful history of Grace over almost 90 years I’m so humbled and challenged. God has been abundantly faithful in His provision and blessing as His people have committed themselves to the mission of Jesus both here on the Central Coast and around the world. Our forefathers and foremothers here at Grace have consistently lived by a bold, risk-taking faith. God has honored the faith of His people and blessed the work of the Gospel for nearly nine decades! Humbled by the faithfulness of God and the faith of His people, we now stand together on the threshold of the NEXT chapter of the story God is writing at Grace Central Coast. That’s US! YOU and ME. WE. TOGETHER. Grace has never been a museum to be maintained! Faithfulness in every generation is not maintenance, but multiplication! We believe Grace’s greatest days are not behind us but in front of us. The mission of Jesus is not yet finished on the Central Coast. The love of Christ compels us to do all we can to keep reaching our neighbors and the NEXT generation with the Good News of Jesus. Together we are seeking what’s NEXT. Together we are stepping into what’s NEXT. Not just what’s NEXT for our church as a whole, but what’s NEXT for each of us in our relationship and following of Jesus. Let no one of the family of Grace sit on the sidelines. All in! All eyes on Jesus! Jesus calls ALL OF US to the joy and thrill of His mission. Lord, lead us to what’s NEXT! ONE GOSPEL FAMILY. ONE GOSPEL FUTURE.